The death of his friend Pierre-Octave Ferroud profoundly affected Poulenc and he sought solace in his long dormant Catholic faith. This religious reawakening inspired a period of creativity which resulted in the two sacred masterpieces on this recording - Messe en Sol Majeur (1937) and Quatre motets pour un temps de pénitence (1938-39) - in addition to many smaller works. The Messe is strictly speaking a missa brevis because the Credo is omitted. It is dedicated to the memory of Poulenc's father who had died several years previously. Here, as in the Quatre motets, one is struck by the cool purity of the choral writing. The complex lines of the Kyrie give way to the Gloria with its richly textured second section and the slightly comical uncharacteristic leaps of the third section at 'qui tollis'. But it is the lovely bright Sanctus opening in a fashion not unlike that of Fauré and proceeding to a contrasting reverential 'Hosanna'; and the beautiful 'Bendictus' that linger most in the memory. The Quatre motets are equally beautiful, affectingly so in the opening of the Vinea mea electa. Quatre motets pour un temps de pénitence concerns the Passion of the Crucifixion. Poulenc's well-known musical style is apparent in these works - i.e. elements of French Renaissance; of jazz and the popular harmonies of the 1920s and 30s (although these are muted); and of religious and spiritual ecstasy. 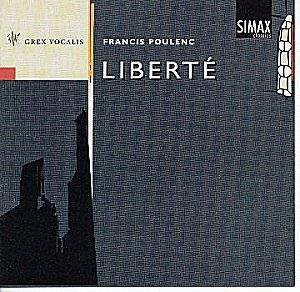 The German occupation of France during the Second World War deeply affected Poulenc and his music. The choral cantata Figure Humaine composed in 1943, during this period, is an intense and moving testimony to the senseless cruelty of war. Un soir de neige (1944) is on a smaller scale yet it echoes many of the ideas of Figure Humaine. I listened to these two works as the sun set on a December afternoon after lighting the countryside in that sort of liquid light that beautifies so many winter days. I thought it very appropriate to the cool crystal-like beauty of the music of these two works. Grex Vocalis (The Singing Flock) is a Norwegian Choir who have distinguished themselves by winning major competitions all over Europe. Their glorious singing has been recorded most sensitively in Uranienborg Church so that the spatial and dynamic elements and the ppp passages so important for the music to breath and make its maximum impact, are fully realised. This is especially the case in the opening Quatre motets.